After the completion of the Parkes 64m radio telescope, an antenna-related research program was established in CSIRO to improve aspects of the radio telescope’s performance. One critical area was the development of high-performance feedhorns characterised by improved antenna efficiency, a symmetric pattern and low cross-polarisation. These horns, which were modified from having a smooth internal surface to one having internal corrugations, produced the ideal wave (a hybrid-mode) as predicted theoretically. The CSIRO researchers recognised the potential advantages of such feedhorns for earth-station antennas used for satellite communications. CSIRO collaborated with Australia’s satellite communications organisation, the Overseas Telecommunications Commission (OTC), through earth-station antenna upgrades, followed by the design and manufacture of new antennas for OTC’s customers in both Australia and overseas. As it turned out, the benefits of the CSIRO discovery became available when Intelsat, the international satellite communications carrier, was applying dual-polarisation technology to its new Intelsat V satellites to give a doubling of the bandwidth. Thus CSIRO’s research program on satellite earth-station antennas grew out of the needs of pure science for improved radio telescope performance. In turn the experience gained from the participation with industry in the design and manufacture of earth station antennas subsequently ‘fed-back’ into the design of improved antennas for the radio telescopes in the Australia Telescope Compact Array facility. Following World War II, technical expertise developed at CSIRO Radiophysics in Sydney for radar applications, was put to work in supporting the new scientific field of radio astronomy. Initially, technologies such as antennas and receivers were relatively simple. However, by the early 1950s, it became evident that radio astronomy would become a ‘big’ science demanding high levels of financial support and new or improved technologies. It was Edward (Taffy) Bowen appointed as Chief of Division in 1946, who led the drive for a large steerable single reflector antenna with both high gain and resolution. He obtained funding from foundations in the USA which was matched by the Australian Government. Also a CSIRO scientist and engineer, Harry Minnett participated in the design study undertaken by Freeman Fox and Partners in the UK. The construction contract called for a 64-m diameter antenna with frequency operation to 3 GHz. In the meantime, a site had been found near Parkes, NSW for its location. The antenna was officially opened in 1961, and was brought into operation for astronomy observations in 1962. Interestingly, the antenna was designed before the existence of sophisticated computers, and because of the need to make provision for adequate contingencies, the manufactured antenna was far more robust than originally called for. The effective ‘over-design’ of the antenna has been a critical factor in permitting upgrades over the 50 years since its completion (see also Parkes radio telescope construction). The Parkes radio telescope (often called just ‘Parkes’ or ‘the Dish’) became the centre of attention of the astronomy community as well as NASA (National Aeronautics and Space Administration) of the USA, and its technical arm JPL (Jet Propulsion Laboratory) located at Pasadena, California. Around the time of the completion of Parkes, these organisations were investigating the possibility of building three 64-m antennas for their Deep Space Network, and showed strong interest in collaborating with CSIRO. 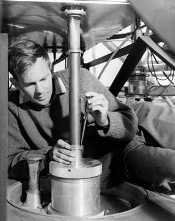 In 1962 Harry Minnett was assigned to lead two critical areas of antenna research which were seen to impact on the performance of Parkes. These studies were to include research under contract to NASA. A CSIRO engineer, Don Yabsley, was responsible for investigating the reflector surface accuracy and in 1964, Bruce Thomas, who had just completed a PhD in antennas at the University of Melbourne, was appointed to undertake research in feedhorn development. Large reflector antennas have a large main reflector (such as the Parkes radio telescope), but may also have additional smaller reflectors so as to modify the location of the focus to a more convenient position closer to the vertex of the main reflector. This could be useful for providing easy access to the feed system, for example. Prior to CSIRO’s research program in advanced antenna technology, feedhorns (whether for radio telescopes or earth station antennas) had a smooth internal surface. The feedhorn research program was initially under-pinned by a theoretical study of the focal-region fields of the Parkes radio telescope. The research showed that the typical smooth internal surface of an existing horn should in fact be corrugated for the propagation of the desired ‘hybrid-mode’. A cylindrical corrugated feedhorn which would be appropriate for the Parkes radio telescope was designed and tested in the laboratory. The measurements showed that the field emanating from the horn (assumed to be transmitting) had a pattern which was symmetrical and had negligible cross-polarised energy – the ideal field distribution for illuminating a symmetric reflector such as the Parkes radio telescope. It was now necessary to test corrugated feedhorns on the Parkes radio telescope itself. Two different feedhorns were manufactured and comparison tests were made in 1968. One horn propagated only one hybrid-mode, and the other (a high-efficiency version) propagated two hybrid-modes. The results created much interest in the radio astronomy community, so feedhorns were designed and manufactured for use at other frequencies. The concept and practical results were published in the worldwide technical press and created much interest. Also, with the unexpected involvement of the Parkes radio telescope in the reception of signals for the Apollo 11 moon landing in 1969, a high-efficiency dual-hybrid-mode feed was quickly manufactured to receive signals from Apollo. The success of this project provided further proof of the corrugated-horn technology (see also Parkes radio telescope and the Apollo 11 moon landing). 1978 was a turning point for research in CSIRO when the government of the day emphasised the increased need for closer interaction between CSIRO and Australian industry. In response to this, it was decided to investigate the possibility of the antenna research being applied to satellite earth-station antennas. Until then it had been devoted to improving radio telescope performance. Radio telescopes are designed for receiving only, whereas satellite earth-station antennas need to transmit and receive simultaneously. Also with the increasing use of satellite communications in the 1970s, there was a demand for additional bandwidth. By utilising these corrugated feeds with their natural low cross-polarisation characteristics, coupling between two channels provided by right-hand and left-hand polarisations could be eliminated. Consequently, two oppositely-polarised channels would occupy the same bandwidth, thus conserving valuable radio-spectrum. Previous feed systems did not have such low cross-polarisation, so it was only possible to occupy a given bandwidth with one channel. But how was CSIRO to tap into the rapidly expanding market of satellite communications to increase the likelihood of success? The answer came when CSIRO was approached by the Australian organisation OTC (the Overseas Telecommunications Commission), which represented Intelsat, the worldwide satellite communications organisation, in Australia. In 1992, OTC was merged with Telecom Australia, forming ‘Telstra’. Intelsat was introducing dual-polarisation operation on their new Intelsat V satellites. At the same time, OTC was required to upgrade their earth-station antennas for dual-polarisation in order to access these satellites. OTC had become aware of CSIRO’s expertise in antennas, and requested CSIRO to participate, under contract, in the upgrade of one of its antennas. The antenna was a reflector type antenna and was the first ‘Cass-horn’ installed by OTC. It was shaped like a huge sugar-scoop, and was located at Carnarvon in Western Australia. It had been installed in 1966 and had suffered from low receive gain since installation. The contract with OTC required CSIRO to investigate the cause of low gain and to develop an appropriate dual-polarised feed system and feedhorn for the Carnarvon antenna. Another special requirement was that the facility was to be used by OTC for satellite tracking and control under contract to Intelsat. While investigating the performance of the existing feedhorn and feed system to establish a ‘bench-mark’ for the upgrade, the design fault in the feedhorn was discovered. This had been reproduced during the manufacture of six other ‘Cass-horn’ antennas which had been installed around the world and had given the antenna a bad name, despite the general concept of the antenna being sound. Following placement of the new feed system in the antenna, testing using a satellite showed that the antenna readily met the new Intelsat stringent specifications. CSIRO had demonstrated that it had the capability to undertake such complex projects. In 1980, following the success of the upgrade of the Carnarvon antenna, OTC requested CSIRO to participate in the upgrade of the Moree dual-reflector 27-m diameter earth-station antenna (the use of this type of antenna was becoming common in satellite communication service).The station had been opened in 1968 to provide communication to Pacific Ocean countries and was to be upgraded with dual-polarisation capability. Since considerable theoretical research had been undertaken by CSIRO for the optimisation of reflector-surface profiles for large antennas, CSIRO agreed to undertake a full upgrade of the Moree antenna in association with OTC. The upgrade was to include a new feed system including corrugated feedhorn, sub-reflector, and the resetting of the main reflector panels to a new optimum profile. The final tests showed that the upgraded antenna met the Intelsat specifications for operation with Intelsat V. This was another success story for CSIRO-OTC cooperation! In 1982, CSIRO participated in a less-ambitious upgrade of the more recent earth-station antenna at Ceduna, South Australia. Of course, if CSIRO was to contribute to stimulating an effective Australian industry in large antenna design and possibly manufacture, the support of an appropriate structural engineering company as a partner would be essential. How realistic was this strategy though? The next stage in the process of designing and manufacturing antennas was to be critical one. The successful CSIRO participation in the three upgrade projects described above, was critical in OTC’s decision to support an Australian venture in the design and manufacture of earth-station antennas for satellite communications. In the first place, OTC desired to expand their business, not only in Australia but also in fast-growing developing countries. Another important factor was the involvement of the structural engineering company of Connell Wagner Pty Ltd (as it was then known) in providing design expertise under contract. This company had undertaken upgrade work for the Parkes radio telescope and had become well versed in structural aspects relating to large antennas. In the first place, OTC required two low-cost antenna designs: one was for a medium-sized 18-m antenna (for the new reduced-diameter Intelsat A standard), and the other was for small-diameter antennas of 7.5 and 9 m for low-traffic use in remote areas. There was also a requirement for a 20-m antenna for controlling and tracking satellites. In these projects, CSIRO was responsible for specifying the optimum optics which included the sub-reflector and main reflector profile definition, the design and manufacture of the feed system (which included the corrugated horn), reflector panel layout and associated measurements. At this stage there had been preliminary discussions relating to the formation of a company tentatively called ROMTEL, which would include partners CSIRO, OTC and Connell Wagner, but after some consideration the concept was put on hold. As it turned out, OTC’s requirements for earth-station antennas was not the only antenna project in the ‘pipe-line’! CSIRO had applied for funding to design and build a new radio telescope at Narrabri, NSW, called the Australia Telescope Compact Array (ATCA). This facility consisted of six 22-m diameter antennas located on an east-west ‘railway’ line. Both Connell Wagner and the antenna manufacturer, Evans-Deakin Industries, were involved. The work on both ATCA and the earth-station antenna program proceeded simultaneously, with stringent dead-lines set for both projects! The ATCA antenna and feed system work is described in two papers in a Special issue of the Journal of Electrical and Electronics Engineering. These are: Cooper DN, James GL, Parsons BF, Yabsley DE, 1992, ‘The antennas’, In: Special issue on the Australia Telescope, Journal of Electrical & Electronics Engineering, Aust, 12: 121-136; James GL, 1992, ‘The feed system’, In: Special issue on the Australia Telescope, Journal of Electrical & Electronics Engineering, Aust, 12: 137-146. In regards to OTC’s immediate needs, four 18-m antennas were to be located at Perth, with additional antennas at Oxford Falls in Sydney, Vietnam and Cambodia. Overseas destinations for the 7.5-m antenna included Cambodia, Laos and Sakhalin. Outside Australia, OTC carried out the installation of equipment and assumed responsibility for the installation of the antennas as part of their entrepreneurial strategy at the time. The installation of the earth-station in Vietnam was undertaken when there was a general worldwide embargo on the importation of equipment into Vietnam. The availability of an Australian made antenna which could be exported to Vietnam was crucial in OTC being able to successfully fulfill their contract and to maintain a dominant position there. Again, Connell Wagner was involved in the structural design, and the company Johns Perry was awarded the contract by OTC to manufacture the antennas. There is a certain ‘buzz’ about participating in such projects with ‘turned-on’ industry partners. Definite goals and time schedules have to be met, most of which are based on sound scientific and engineering principles. There is a final testing procedure which is overseen by Intelsat as a user of the system. After many weeks of hard work preparing the antenna and feed system during the pre-test phase, there is nothing more exhilarating than to receive the final message of acceptance by Intelsat and extended thanks from OTC management. Of course, our own Chief’s obvious delight at hearing of a positive result was the ‘icing on the cake’. Although the design of the OTC earth-station antennas commenced some time after the 22-m diameter antennas for the ATCA radio telescope, the construction and preliminary testing of the OTC 18-m antennas were completed before those for the ATCA facility. The success of the acceptance testing phase of the OTC 18-m antennas gave those who were to test the ATCA antennas, much comfort in the overall design procedures being used. In 1990, the Department of Defence accepted a bid by a Joint Venture consisting of the two firms AWADI and Baulderstone Hornibrook Engineering, for the design and construction of four 26-m antennas for the Australian Defence Satellite Communication Station (ADSCS) at Geraldton, WA. This particular facility required special frequencies to be provided. CSIRO carried out design and testing services under contract to Connell Wagner and the Joint Venture. It was found that the reporting procedures and quality assurance programs were unusually stringent, and not always sitting comfortably with some members of the CSIRO staff! The project was successfully completed in 1993. CSIRO’s research program with application to satellite earth-station antennas grew out of the needs of pure science, that is, for improving technological aspects of radio telescopes. The experience gained from the participation with industry in the design and manufacture of earth station antennas has itself ‘fed-back’ into the design of antennas for the radio telescopes for the ATCA facility. However the need of such specialist technology for industry use, such as satellite communications, appears to be transient in nature, that is, the underpinning research is supporting a ‘niche’ market. Another example of this is the more recent research carried out by a colleague, Trevor Bird, who saw the potential need for multiple-beam earth-station antennas for communications through a number of satellites simultaneously. This research led to successful commercialisation in 2006. The success of CSIRO’s contribution to the OTC earth-station antenna program left a positive impression on OTC. As a result, a senior OTC engineer was able to convince his management of the importance of research in supporting technical projects. A Research Unit was established within OTC which formed links with external collaborators. CSIRO was a participant in some of the projects. In 1991, CSIRO management requested a study to be made by the Bureau of Industry Economics to quantify the overall success of the earth-station antenna program. A benefit-to-cost analysis showed that the ratio of benefits to costs was 2.0 for antennas located in Australia, and 3.1 for antennas installed overseas. The overall benefits were valued at $38m at that stage. The CSIRO staff who along with Bruce Thomas made significant contributions to the research and development programs, and who participated in testing programs, including those on-site, include: GL James, DE Yabsley, KJ Greene, BF Parsons, MJ Kesteven, and RE Shields. Likewise N Guoth and JT Schafer of Connell Wagner, and the technical and engineering staff at OTC, all provided dedicated and enthusiastic support.